It was a little like déjà vu. The scenario leading up to me trying this sandwich bread recipe was very similar to what happened when I first learned about the super-easy English muffin loaf bread recipe. Just like last time, I was watching a show from America's Test Kitchen on PBS. The subject was an easy-to-make sandwich bread - one that's a no-knead batter bread. In essence, it was the same promise (just a different kind of bread this time) - an easy, tasty, homemade bread without a lot of time or effort. I might have been calmer this time, not quite as fanatic as the first time I heard of this notion of a batter bread recipe (basically, a bread dough that's mixed together like a batter without any kneading) that I could actually tackle. All the same, I still went in search of my notepad, wrote down the recipe, and got in the kitchen within a few days to give it a try. Just like that English muffin bread recipe, this one looked so easy and I had to see if it would pan out that way in "real" life. Hooray...it really did! I may not have the skills to get the top of my bread even or looking as smooth and lovely as it turns out on TV but as I went through the steps of making this bread, everything happened as it should have. So the story with this sandwich bread recipe is simple. The recipe relies on more water and more yeast to create a wet, sticky, batter-like dough. Mixing happens in the stand mixer but you don't even need the dough hook, using the standard paddle attachment instead. Because of the higher than typical amount of yeast and water, you only need two short rises - about 20 minutes each - before popping it in the oven. There really weren't any surprises and the dough behaved just the way I saw it unfold on the show. The result was a fragrant bread with a soft texture and a nice, mild flavor. I'm thrilled to know I can practically whip up a loaf of sandwich bread at home as long as I've got some instant yeast and basics around the house! I may not bake my own bread regularly but whenever I do, it feels like I've managed some sort of magic trick. I'm glad so many "magicians" are willing to share their secrets with us. Since the method/steps to making this dough are a little unusual (easy, just a little unconventional), you should definitely read through the entire recipe before starting. And there's a lot to like about this recipe. The relatively short time investment is key, with just two 20-minute rises, before a 40-minute bake time. Before I start, I'm always a little worried about my bread not rising enough. In the photo above, the bread is set into a loaf pan after a first rise in the mixing bowl. Be sure to grease your spatula to easily maneuver the wet and sticky dough. As you can tell in this second photo, the dough did rise significantly during the second rest at room temperature. In fact, you cover the loaf pan for the first 10-15 minutes and then remove the plastic wrap and let it finish rising another 5-10 minutes in order to prevent the dough from touching and sticking to the wrap. I love peeking into the oven window with the light on and seeing the bread puff up and come to life. Then, you start to smell that wonderful fresh-bread scent. I was very happy to pull this out of the oven! And I was possibly even more happy to see that when I sliced into the loaf - after cooling the bread completely - that I had a light, soft interior. It was bread ready to be spread or layered with our favorite fixings. At the end of the day, the first thing I always want to do with homemade bread is toast it and slather a bit of salted butter onto it. I love really crunchy toast so I tend to go a little overboard on the toasting but for a serious crunch-lover like me, homemade bread is heavenly because it makes for the crunchiest toast! A little slather of condensed milk on top of the buttered toast would be even better. Anyone else willing to brave the heat, crank up the oven, and bake some bread with me? In the bowl of a stand mixer fitted with the paddle attachment, whisk the flours and yeast together. Add melted butter, honey, and water to the bowl. Beat on low for 1 minute to combine. Raise speed to medium and beat for 4 minutes, scraping halfway through with a greased spatula (the dough will be relatively wet and sticky). Thoroughly scrape down the sides of the bowl, cover with plastic wrap, and let rise at room temperature for 20 minutes. Dissolve salt with 2 tablespoons water. Add salt water to dough. Place bowl back on to the stand mixer and mix on low for 40 seconds. Mix on medium-speed for another minute. Again using a greased spatula, scrape the dough into a greased 8 1/2 by 4 1/2 inch loaf pan. Nudge the dough to the edges of the pan using the spatula. Cover pan with plastic wrap and let sit for 10-15 minutes at room temperature. Remove plastic wrap and allow bread to rise another 5-10 minute (this way, the surface of the bread won't touch the plastic wrap). Preheat oven to 375 degrees. Brush the top of the bread with egg wash. Bake for 40-45 minutes, until bread has domed and reaches an internal temperature of 208-210 degrees. Carefully remove bread from the loaf pan. Brush the top and sides of the bread with 1/2 to 1 tablespoon of melted butter (for flavor as well as to soften the crust of the bread). Let bread cool completely before slicing. Bread is best the day it's baked but can be wrapped and stored at room temperature for up to 3 days. Freeze for up to 1 month. So soft and golden brown...excellent, Monica. Thanks, Angie. It's just a good recipe even I can follow with good results! I've never made homemade bread. Why not? It looks so good!! I must try. 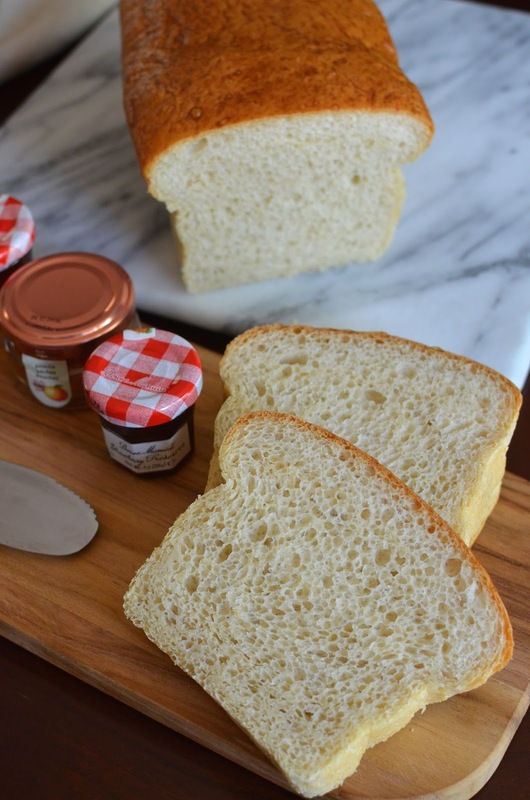 I make english muffin bread almost every week so I feel like I need to try this!! I love that there's just a touch of honey in the dough too. Ha! I totally turn on the oven light and watch my bread bake! It's fascinating!! Hope you had a great weekend Monica! You make the prettiest breads! The smell of homemade bread is my favorite! I haven't made a loaf all summer and now I can't wait to try this. Love this easier method and that you don't need the dough hook! It looks perfect! Yes, those air pockets are nice...they make for crunchy toast but overall, the texture is so nice and soft. Great for a sandwich - and that's just what I used it for today for my little one for camp. Hi Monica, when you look at your bread loaf and slice they both look perfect. This almost sounds like something I could make. I haven't made bread in forever, but this looks and sounds too easy not too! I see lots of homemade bread PB&J's in my future. This loaf is gorgeous Monica. The texture of the bread looks light and amazing, and I can almost smell the yeasty goodness. Wow - just beautiful! It toasts wonderfully too! It's so nice and soft, Tricia. So for those who might not want their toast super crunchy (like my husband), you can just very lightly toast it or use it as is for a sandwich. This is such a gorgeous loaf! I love the fact that it is no-knead, saving it to try soon! It's very easy - hope you give it a try, Jasline. Thanks! YES! This bread is what I need! Thank you! I am a big big fan of bread. I bake it quite often and I am sure you would have loved the process. It's all so beautiful. The honey is a perfect touch. I could sit and watch it bake in the oven throughout . Your bread has the perfect holes and looks so so good toasted and with jam. Hope you enjoy every slice. I never knew you could make sandwich bread this easily! I can't wait to try it! Tell me about it! : ) I'm sure you will be pulling out a beautiful loaf soon. The bread looks so moist and fresh! And love how easy it is! Addition of honey sounds so good! Can't wait to try this recipe! Wow - this is so incredible - I can't wait to try it out! Thanks so much for digging this up and sharing all those beautiful photos! Hi Jess - thanks for swinging by! I have many posts of yours to catch up on! Great to hear from you and hope your and your adorable family are doing great! What a beautiful bread! Would be perfect for my breakfast! I am definitely going to try this recipe! This bread looks absolutely sensational!! The bread is perfect! I always seem to have problem getting bread to raise enough. A crunchy toast wins my heart too, especially with salty butter and jam. I am adding this to my to-try list! I definitely recommend you try this one. I have the same issue with the rising usually...either doesn't rise as much as it should or takes much longer. This really did it in the alloted time, right at room temp. Oh, your breads are amazing. I stick to the simple but I am daydreaming about your boule loaf right now. I love that crusty top on it...fabulous! I made this bread twice now. The first time my yeast was old and while it tasted good it was very flat. Bought new yeast and made it yesterday. OMG it is so good. I did not have any whole wheat flour, so used Flax seed meal. Since the WW Flour is just for flavor it is a good substitute. I will be making this more often now. I saw this on the ATK TV Show and was extremely happy to find the recipe and instructions on your site. Thank you. Hi Bonita, you sound like a kindred spirit! Thanks so much for taking time out to write me this. I'm so glad you made the bread a second time with the new yeast. You just can't beat fresh homemade bread, all toasted to your own liking (especially when it's this easy). I love it when I spot a recipe I really want to cook/bake from watching the TV show and it works out. I'm glad I'm not alone. Thanks again! I don't have a stand mixer (ours broke MAKING FROSTING!) so I used my hands. It was really sticky, but came off my fingers really easily with a greased spatula. Mine didn't rise as much and was a tiny bit dense, but it tasted delicious. Next time I'm going to see if the hand held mixer can handle it (probably not, but "nothing ventured, nothing gained."). Troubleshooting help needed! I tried this bread, but I used active yeast, not instant. The dough was way wetter than it was in your picture too, lacked any semblance of structure. It barely rose to the rim of the pan and collapsed in the oven. Ideas? I love the taste, so I'm trying to figure out how to make it rise! Hi - I am no expert on bread making so I can only suggest making it *exactly* according to the recipe - using instant yeast, following the rising time precisely, etc. I remember the dough is very wet and tacky but it really did work just as I saw it on TV. I would make sure to follow it exactly and see that the oven temp is correct, etc. Good luck! I could use some help! I made this recipe yesterday (only the second bread recipe I've ever tried) and it was a fail. I watched the video clip and followed the recipe, but it tasted horrible. It looks beautiful, but it has a weird sour/bitter taste. Does anyone know what went wrong? I just searched to find someone else who had made this recipe and found your blog. Would appreciate the help! Wish I could solve your mystery. The fact that it looked beautiful but had the weird taste made me think of too much leavening...you know how baked goods have a very odd taste when there's too much baking soda in it? Obviously, this doesn't have baking soda as an ingredient but could the yeast have been "off" or old or something...I hope it was just a one off and you'll try it again with perfect results. Oh also yes, it totally reminded me of the flavor when something has too much baking soda. I'll definitely double check that I add the right amount of yeast. Good luck! I think it's definitely worth re-making since it sounds more like some ingredient went wrong. Best to get right to it and try again before you change your mind. : ) Would love to know if it works out next time. Thanks for posting this...I copied the recipe down while watching the program a few years ago. I made the recipe once and it turned out perfectly! I loved it. I looked for it again, but must've misplaced it or thrown it out. I am very happy to find this online. Thank you! Tried the recipe and loved it. Only trouble was getting it out of the pan. It crumbled on the way out. I lined by Pyrex loaf pan with lard. Any suggestions? Thanks for sharing! I used a metal loaf pan that I just sprayed with cooking spray and didn't have any problems getting the loaf out of the pan. Maybe you could try lining just the bottom of your pan with a sheet of parchment paper? Good luck!